The city, which was flooded to make way for a dam, still remains intact underwater for more than half a century. Wikipedia states, “At the foot of the Wu Shi mountain (Five Lion Mountain) lays an ancient city known as Shi Cheng (Lions City), built in Dong Han period (25 – 200), first was set up as county in 208, it was named ‘Lion City’ because of the Five Lion Mountain that sits just behind the city. 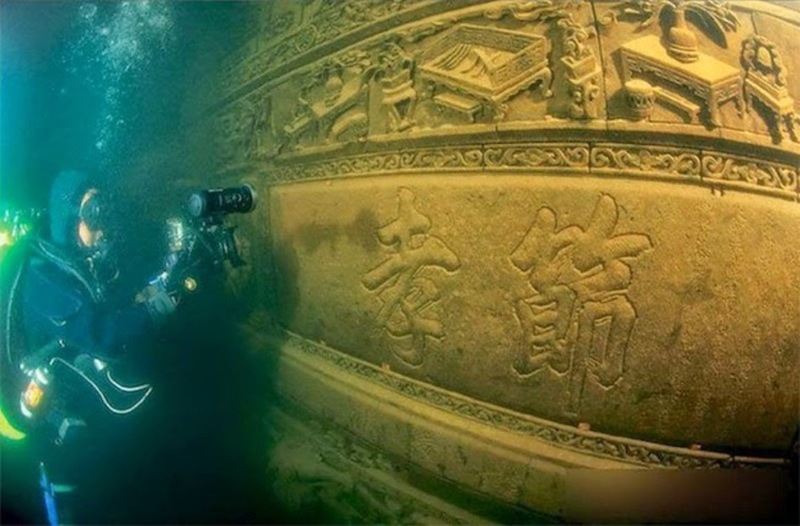 The city remains undisturbed from the surface at a depth of 26-40m, Big Blue dive operator based in Shanghai, runs weekend trips twice a month throughout the year to the city and has started to uncover parts of the lost city. Shi Cheng City, also called the Lion City, because of the Wun Shi (five Lion) mountain behind it, had been founded approximately 1300 years ago. It was once a political and economic hub for eastern China. This Lion city is now located 85 ft to 131 ft beneath the Thousand Island Lake ((Qiandao Lake). This man-made lake located in Chun’an County, Zhejiang, China, formed after the completion of the Xin’an River hydroelectric station in 1959. Around 290,000 people were relocated from the city in which they’ve lived for over one thousand years. 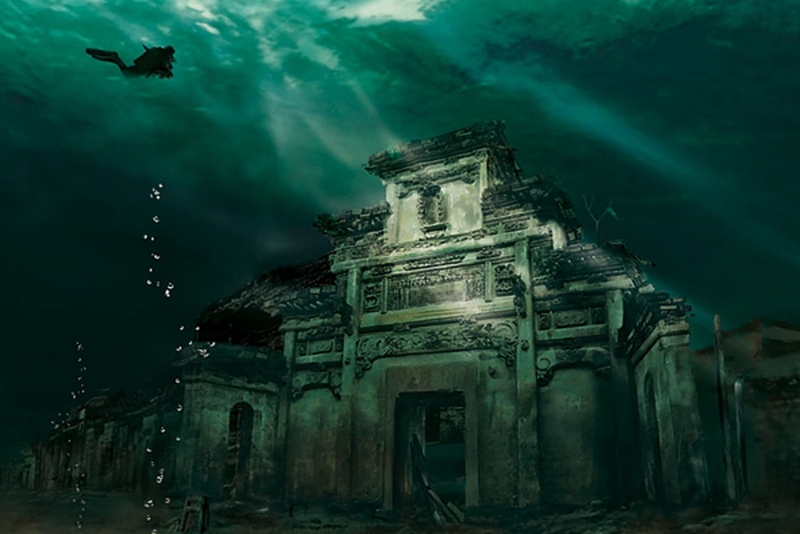 The city was “rediscovered” in 2001 when the Chinese government organized an expedition to see what might remain of the lost metropolis. 265 arches were discovered in the preserved ruins. The city was about the size of 62 football fields. Further in 2011 interest and explorations increased further, when Chinese National Geography released images taken by its divers. Expeditions and underwater photographs have revealed that the city had five entrance gates each with a tower. The city had six main stone streets which connected every corner of the city. Stonework of lions, dragons, phoenixes and historical inscriptions, some of which date back as far as 1777 were found.